Check out a Huff Post A – Sides interview with Jon Chattman & Lauriana Mae here! Lauriana Mae “Ya Neck” will be featured on Love & Hip Hop Atlanta 8:00pm on VH1! Be sure to watch tonight! 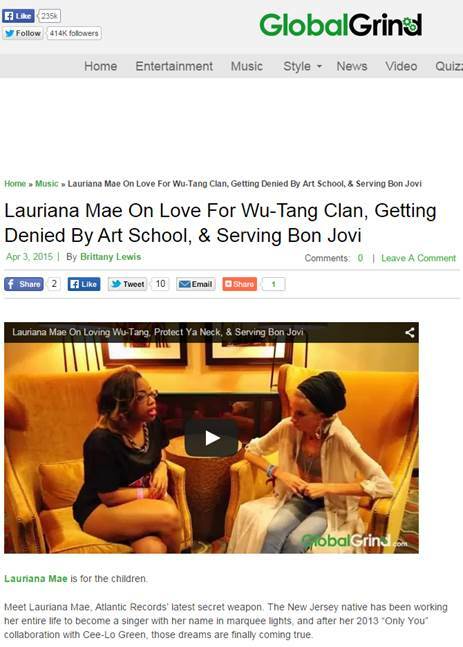 Check out an interview with Lauriana Mae featured on Global Grind here! Check out an interview with Lauriana Mae featured on Galore Mag. Feature also includes an exclusive behind the scenes video from the photo shoot! Check it out here! Lauriana Mae is featured on Rock Mafia's "The Good Life" single, as heard on the ShoeMint commercial, and it's available now on iTunes here! Download it today.